Welcome to our first ever annual performance report. In our June quarterly last year, we wrote about what we thought was a disconnect between the long-term investing we undertake and the focus in our monthly and quarterly reports on short-term performance. We have tried to do a lot less performance reporting over the past year, instead focussing on the progress (or lack thereof) of the underlying businesses in both portfolios. Long-term performance is, of course, why you pay us and every 30 June, coinciding with our annual distributions, we will include this supplement with our quarterly report, reflecting on our returns and where those returns have come from. For the Australian Shares Fund, the past 12 months produced excellent returns. In a year where the tailwinds from equity markets were negligible — the ASX All Ordinaries Index rose just 2.0%, including dividends — the Australian Fund returned 18.1%. 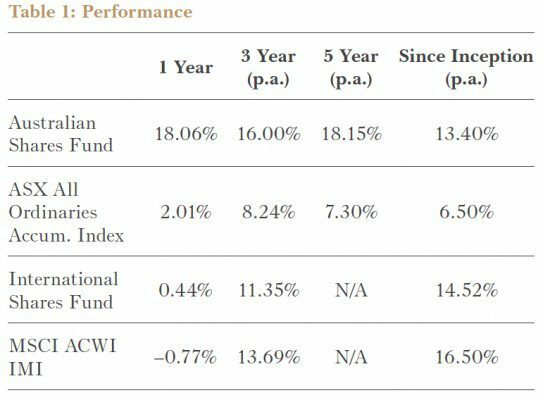 It should be noted that the performance of the Australian Fund is flattered by a poor index return that wasn’t reflective of the overall market. Dragged down by high weightings to banks and large miners, this broad index dramatically underperformed the average stock listed on the ASX. A better barometer of average stock performance, the MVIS Australia Equal Weight Index, returned 8.9% for the year. Our return, 18.1% net of all fees, is still an outstanding result, but any fund manager with a mandate as broad as ours shouldn’t be slapping backs too hard just for beating the All Ords. It was a difficult year for global equity indices too, with the benchmark MSCI World Index falling 3.4% in local currency and 0.8% when measured in Australian dollars. A week before the end of the financial year, the International Shares Fund was looking at meaningful outperformance of that index. Our exposure to the UK and its Brexit vote, however, brought returns back to a level only marginally better than the index (+0.4% in Australian dollars). The broader backdrop has been excellent for our style of investing. Meaningful global selloffs in August last year and January/February of this year provided the volatility we needed to put money to work at attractive prices. More so in Australia, where the index has only returned 6.5% p.a. since the Australian Fund’s inception in October 2009, but increasingly internationally, we are experiencing low overall market returns but dramatic variation within sectors. That variation is enabling us to find opportunities that meet our required return criteria despite an overall market that doesn’t look particularly cheap. Before we jump into the specifics of each fund’s performance, a word of caution. We currently live in a world where all asset classes are priced to deliver much lower future returns than what they have delivered historically. In the case of some – German government bonds and Australian residential property, for example – absurdly so. Our goal remains to outperform Australian and international equities but we are not immune to this environment. You should expect future returns to be lower than what have been seen in the past. The Australian Shares Fund delivered a return of 18.1% for the year ended 30 June 2016, outperforming the All Ordinaries Accumulation index by a whopping 16.1%. It is our second largest year in terms of absolute performance and, as you can see in the chart below, is it also our second biggest year of outperformance since inception, albeit attered by the index’s woeful year as described above. The five year return is now in excess of 18% per annum. The biggest contributor in 2016 was utilities and telecommunications contractor Service Stream (SSM), which saw its share price rise 164% during the year. We won’t rehash the story here as it has been told before, but we started the year with a large weighting and were well rewarded. Vision Eye Institute was a stellar performer early this financial year thanks to a takeover offer from Chinese group Jangho. After some argy bargy the Chinese finally stumped up $1.075 per share in cash and, although the company’s substantial franking credit balance went to waste, that represented a nice 62.3% improvement on the 30 June 2015 price of $0.66 per share. The Fund finally exited stellar performer Hansen Technologies (HSN), but it added another 1.2% to returns prior to departure. Fellow technology companies Jumbo Interactive (JIN) and Smart Parking (SPZ) had good years too, adding 2.4% and 1.4% respectively. Both companies showed decent progress in reversing the poor performance of previous years. Whitehaven Coal (WHC) enjoyed a three week stay in the portfolio but returned 99.7% during that time. Mining services was expected to be a mixed bag but we would have preferred a little less mixed than it turned out. We included the table below in our June 2015 Quarterly Report and update it with the returns across the year. 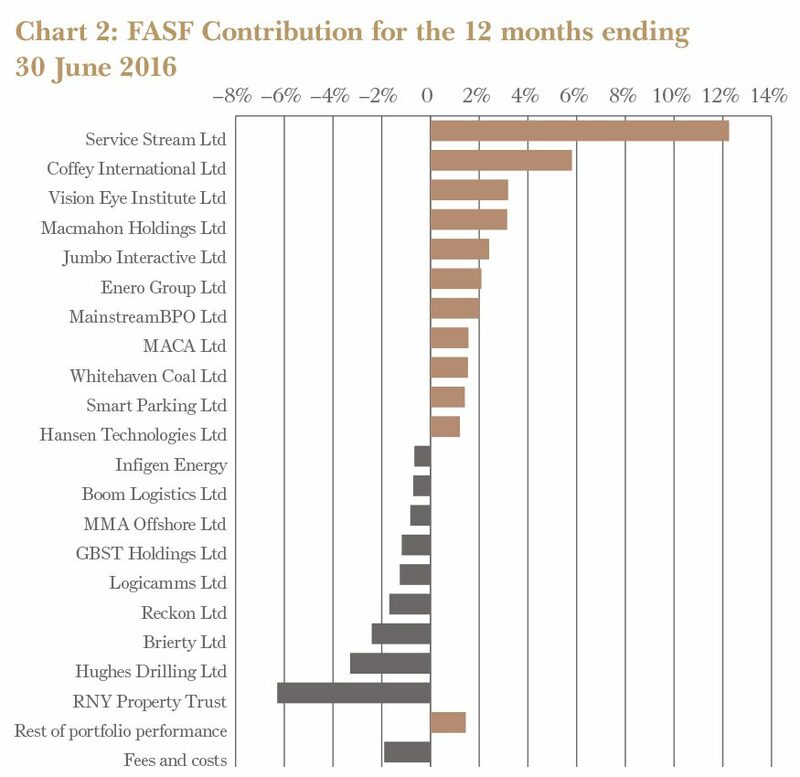 Coffey International was taken over at a huge 203.6% premium to its 30 June share price and both Macmahon Holdings (MAH) and MACA (MLD) have made meaningful contributions — 3.1% and 1.6% respectively. That’s about where the good news ends. Watpac (WTP) hasn’t been a disaster but the abandonment of its capital management program means we are unlikely to ever see its surplus cash returned to shareholders. Boom Logistics (BOL) looks to have extricated itself from troubles but still saw its share price fall 31%. Logicamms (LCM, down 43.4%), Brierty (BYL, down 74.2%) and MMA Offshore (MRM, down 43.5%) have all had woeful years and seen their share prices appropriately punished. 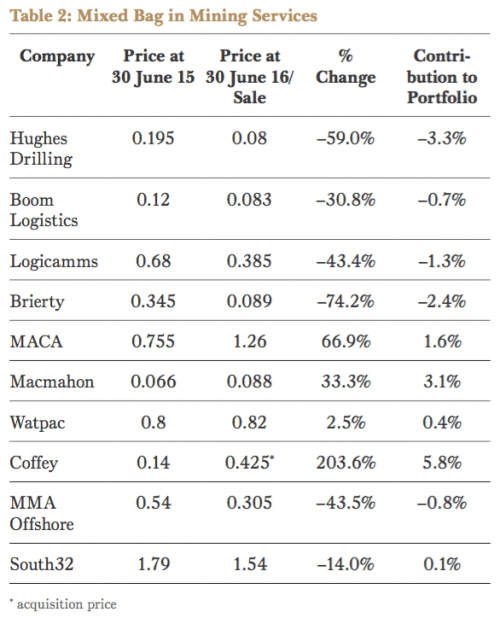 Worst of all in terms of portfolio contribution is blast hole drilling company Hughes Drilling (HDX). This company’s woes are entirely self-inflicted (see June 2016 Quarterly Report) and it is shaping up as a potential loss of our investment. All in all, the net contribution to the portfolio from this basket is 2.5% in the past year, a reasonable outcome but one that could and should have been much better. Reckon (RKN) also knocked something off returns for the year, although that investment is in the very early stages (see June 2016 Quarterly Report). And GBST (GBT) finished a tumultuous year with a tumultuous week, the share price falling 16.0% post Brexit thanks to its significant UK exposure. The biggest negative contribution came from one of last year’s best, US office owner RNY Property Trust (RNY). The units fell 56.7% over the course of the year and, while we are still hopeful of a good outcome from here, there are valid reasons for the decline (see the March 2016 Quarterly Report). While the net result for the year was outstanding, you can see from the above commentary that it hasn’t all been plain sailing. Some years we will see great progress on our underlying investments without it being reflected in performance. Other years we will report performance that overstates the underlying performance of the portfolio constituents. 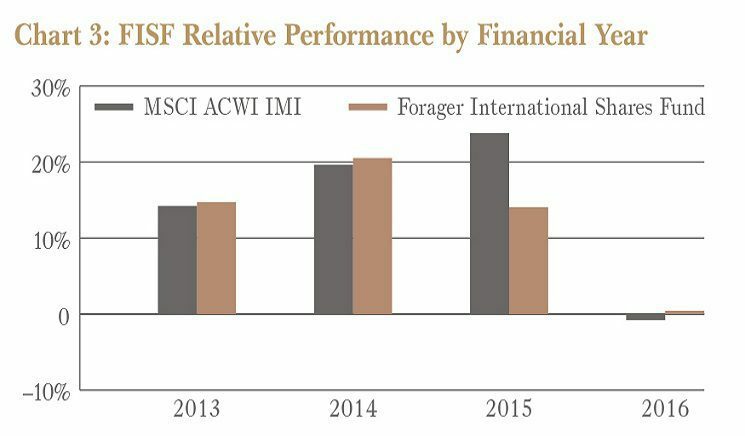 Up until the last week of the year, it was shaping up as a decent year for the Forager International Shares Fund. Meaningful exposure to the UK, however, dragged the Fund’s performance back to a level only slightly better than the index. The return was just 0.4% for the year, albeit against an index that delivered –0.8%. Despite many supposed experts predicting dramatic declines in the Australian dollar over the year, at 1.9% the impact of currencies on the portfolio was relatively minor. This was slightly below the 2.3% positive contribution FX made to the index, mostly as a result of our outsized exposure to the UK. At an underlying portfolio level, our losers were generally smaller positions than our winners. But there was no shortage of them. Europe was the source of most of our woes. Dolphin Geophysical (formerly OB:DOLP) was our biggest unforced error, with the oil services company filing for bankruptcy late in 2015. We’d sold our last shares a few months earlier, but not before most of the damage had been done. The offshore seismic market collapsed with the falling oil price, but ultimately it was too much debt and operational leverage that did it in. Our main mistake here was not adequately stress testing the idea to a much lower oil price than the US$100/barrel it traded at the time of our original purchase. Continuing to hold Dolphin from 1 July 2015 until our final sale in November 2015 clipped 2.6% from the Fund’s annual performance. 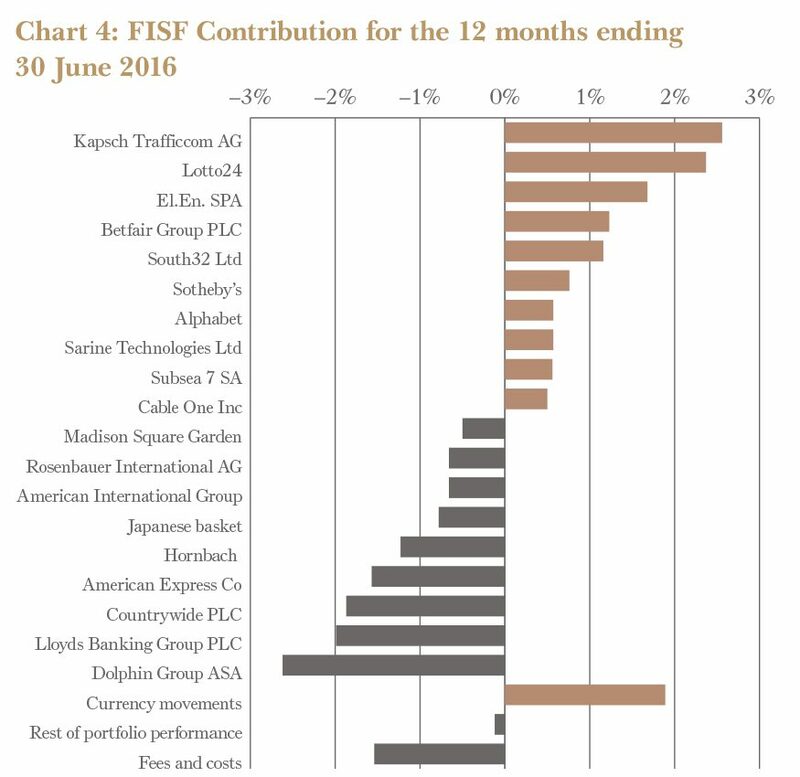 The Fund’s UK exposure was a severe detraction from performance. The Kingdom’s largest bank, Lloyds Banking Group (LSE:LLOY) fell in sympathy with other European banks and individually struggled with larger than expected compensation payments for the way it sold Payment Protection Insurance (PPI) in the banking boom years in Britain. Brexit fears have also weighed more recently. The stock is down 36.6% since 30 June 2015 and weighed down the Fund’s annual return by 2.0%. UK real estate agency conglomerate Countrywide (LSE:CWD) was another large error. This time last year, the stock was flying high on the likelihood of a post-UK election bounce in housing exchange transactions. Fine in theory but it didn’t happen in practice. Growth in the lettings business hasn’t been fast enough or lucrative enough to compensate. Countrywide is down 56.8% since the start of the financial year and detracted 1.9% from overall annual performance. In the US, blue chips American Express (NYSE:AMEX) and American International Group (NYSE:AIG) were negative contributors. Amex was one of the large companies that made way for our new smaller investments, but not before it did some performance damage. The share price was down 32.1% between 1 July last year and the date on which we sold. AIG’s shares are down 14.4% since 30 June 2015 and it will be making room too, if its performance doesn’t improve soon. A major and unexpected reserve charge on its insurance book has reduced our confidence that it can achieve a long-term turnaround. Poor investment returns from hedge funds and other alternative asset classes magnified the issue. As a result of position lightening and underperformance, AIG has gone from the Fund’s largest position a year ago to 10th today. German DIY retailer Hornbach Baumarkt (DB:HBM) and its parent company Hornbach Holding (DB:HBH) are viewed by us as one position, a combined weighting of around 5% at the start of the financial year. Despite reasonably healthy sales growth, Hornbach Baumarkt has fallen 24.5% over the course of the financial year, with Hornbach Holding faring little better. The problem? What was already a hyper-competitive German DIY market has only gotten more so. The company’s operations elsewhere in Europe are doing well. The two stocks combined reduced the Fund’s annual returns by 1.2%. Rosenbauer International (WBAG:ROS) has fallen 30.2% over the course of the year and clipped 0.7% from annual returns. Sales growth for the Austrian-based world leader in fire fighting trucks was okay but an expected improvement in margins failed to materialise, partly the result of some one-offs including a rare production misstep on the introduction of some new models at a fairly new factory. Those are solvable issues and we’ve added to the position over the course of the year. The best performer in the portfolio was Austrian tolling technology company Kapsch TrafficCom (WBAG:KTCG). That investment has played out largely to thesis, being that the new build part of the business would stop losing so much money thus allowing annuity-like revenues to shine through from the other main segment. The stock is up 51.8% over the course of the year and added 2.6% to overall performance. We’ve been a light seller over the year as the risk/reward equation becomes less lopsided in our favour. German online lotteries seller Lotto24 (DB:LO24) was the other big winner of 2015/16, rising 51.5% and contributing 2.4% of fund performance as the company adds customers at a rapid rate and steams towards cash ow breakeven. We felt the market was severely discounting future prospects a year ago — and while it’s come around plenty we think there’s more to go. Newish portfolio addition El.En. (BIT:ELN) rounds out the European leaders, adding 1.7% to performance for the year. The Italian laser company was bought in the early days of calendar 2016 at a price we considered too cheap in light of the company’s strong near term prospects (see June 2016 Quarterly Report). The market has partly come around to our way of thinking, and the stock has risen 41.4% on our average purchase. Betting exchange Betfair, now Paddy Power Betfair (ISE:PPB), has been one of the Fund’s biggest winners both this year and last. We sold out in the first half of 2015/16, but not before the stock rallied 26.1% above the 30 June 2015 price. Boosted by operating results and a merger with Irish bookie Paddy Power, the stock added 1.2% to our returns this year. We first bought BHP Billiton offshoot South32 (ASX:S32) early in the financial year at prices similar to today’s. It was doubling the position size in the panicky days of early 2016 at prices below $1 that explains the substantial 1.2% addition to the Fund’s returns. We’ve pared that position back again on the subsequent rally, but it’s still a meaningful investment. We’re happy with the company’s assets and management’s cost focus. It’s a similar story for auction house Sotheby’s (NYSE:BID) which, despite a generally deteriorating outlook, has risen 21.6% from our average purchase price in January 2016. The stock contributed 0.8% to the Fund’s return. Other smaller contributions came from Alphabet (NASDAQ:GOOG), Sarine Technologies (SGX:U77), Cable One (NYSE:CABO) and Subsea 7 (OB:SUBC). The latter has had a horror year, with the oil price plumbing multi-decade lows in January. Some opportunistic purchases of it and fellow oil services company Haliburton (NYSE:HAL) helped us recoup losses and more as share prices rebounded alongside the oil price. 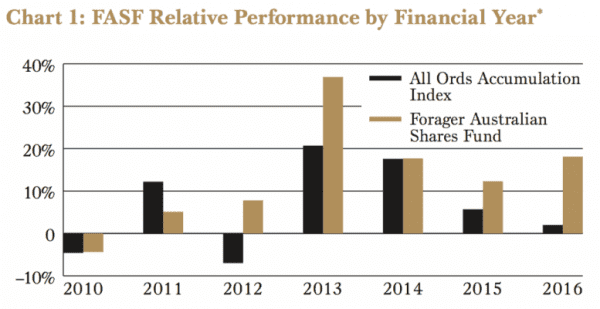 Overall, we would describe the year as a frustrating one for the Forager International Shares Fund, not dissimilar to the early years of the Australian Shares Fund. As you can see in the individual results, there has been enough go right for us to have produced good results in a difficult year. Fewer mistakes will allow those returns to come through in future.